As the Marin IJ reported, the Golden Gate Bridge, Highway, and Transportation District (GGBHTD) has decided to push forward with studying the cycling and walking toll on the bridge. The vote was very close, 10-9 in favor. All but one of San Francisco’s representatives, John Moylan (who represents San Francisco’s mayor), voted against studying the toll. All but one of the northern representatives, Marin supervisor Kate Sears, voted for studying the toll. This includes Marin supervisor Judy Arnold and Tiburon mayor Alice Fredericks. Most of the arguments for the toll, as relayed by people covering the meeting on Twitter, were more that it was important to examine it regardless of whether it’s a good idea, not that the toll itself would yield any non-financial benefits. One observer on Twitter, John Murphy of Healdsburg, made the point that the toll could have a number of unintended consequences, mostly around trailheads. By email, he argued that recreational cyclists consider the ride from San Francisco to West Marin “junk miles.” A toll would be just one more reason to drive to Marin on weekends, exacerbating tourist traffic on Shoreline Highway and parking around trailheads. He further made the point that tourist cyclists already often pay into GGBHTD’s pot by taking the Sausalito Ferry back to the City after riding across the bridge. Without Clipper cards, these riders pay the full cash price. According to commentary from MCBC on the 2005 proposal (the report itself isn’t available online), the proposed toll would raise somewhere between $600,000 and $1.8 million in 2014 dollars, or roughly between 9 and 27 percent of the five-year shortfall. Unfortunately, the 1998 report indicated there would be no way to charge the toll except with in-person toll-takers, which would cut significantly into the revenue and cause huge lines to enter the bridge. Murphy, the Healdsburg commentator, pointed out that this would force people to spend more time parked, exacerbating the significant parking crunch. There is another way to target tourist traffic, of course, one that would target tourists exclusively. Rather than charge people for the opportunity to walk across the bridge, GGBHTD should charge for the opportunity to park at either parking lot, and allow tour bus companies to reserve bus parking spaces for a flat fee. This is part of the strategic financial plan, under item 21. Already, tourist traffic at the lots can cause backups onto the bridge; charging an appropriate amount for parking would reduce that congestion problem and raise money simultaneously. It would target tourists exclusively and wouldn’t require much more infrastructure than parking meters. It’s an idea that deserves study, rather than one more look at a bike/ped toll. For now, the toll is not a done deal; it is only being studied. To ensure it doesn’t, write to your representatives who voted for the toll. Let them know there are better ways to raise money. This week, tolls increased on the Golden Gate Bridge for the first time in 6 years, to $6 with FasTrak. Though there was some grumbling and a bit of consternation from drivers who now need to deal with a more expensive commute, these cost hikes are no stranger to transit riders, who have faced annual fare increases for over a decade. 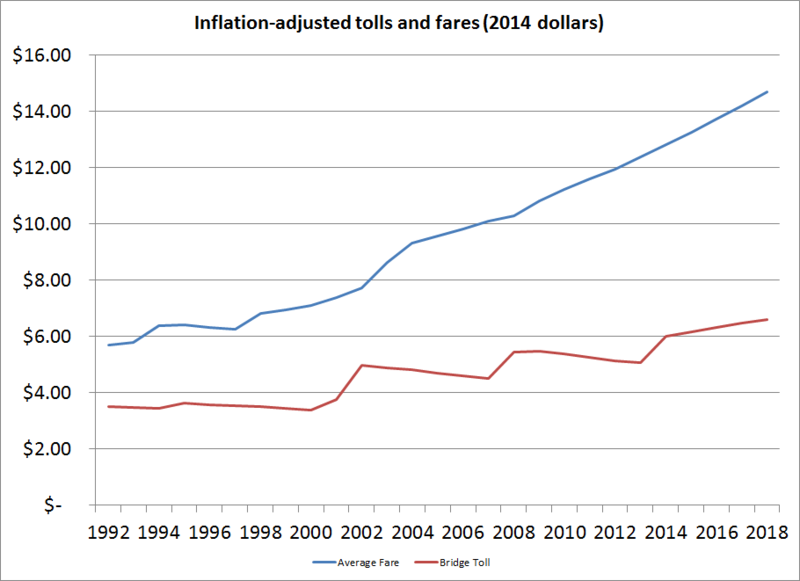 Inflation-adjusted fares and tolls in 2014 dollars through 2018. Notice that the fare’s increase is not linear, which is because the annual hikes are percentage-based, not dollar-based like the tolls. 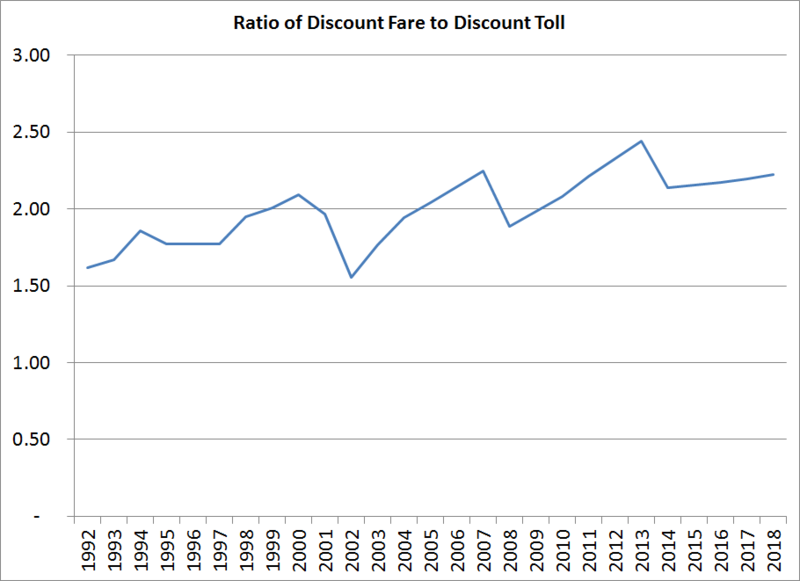 Ratio of the average round-trip discount transit fare to the average discount toll, through 2018. Notice that the gap still increases from 2014 through 2018 despite annual toll hikes. That’s because, as fares increase by 5 percent per year, tolls increase $0.25 per year, a percentage increase that gets less each year. In 1992, the average round-trip bus fare was 1.62 times the discount toll. That ratio reached a high of 2.44 last July 1, when the latest fare increase was made. Now that the tolls have gone up, the ratio has dropped to 2.03, the lowest it’s been in 5 years, but that will be transitory. On July 1, when fares increase another 5 percent, the ratio will head back up again, to 2.14. If fares continue to increase 5 percent every year, that ratio will continue to widen, even with annual $0.25 toll hikes, to 2.22 in 2018. Strictly from an equity perspective, this is unjust. Bus riders tend to be lower-income, and so have a more difficult time taking fare hikes, while the opposite tends to be true of drivers. Not only that, but others who can’t drive – those who are blind, albino, elderly, and others – are disproportionately hit by fare hikes. By pushing away those who have access to the driving alternative, too, the fare hikes render transit more and more into a second-class social welfare service rather than the first-class transportation service it could be. From a technical perspective, those new drivers adds to congestion at the rush hours, forcing everyone, rider and driver alike, into a slog every morning and night. It’s a terribly inefficient transit system, destroying any advantage of having a freeway. San Francisco, Sonoma, and Marin all suffer. The Golden Gate Bridge, Highway, and Transportation District (GGBHTD) has as its explicit goal that fares should cover at least 25 percent of bus operations and 40 percent of ferry operations. By raising fares regularly, GGBHTD is trying to hit that moving target. Bus ridership has dropped dramatically since 2000 and with it has fallen transportation income, while operating costs have jacked up the price of providing service. To compensate, GGBHTD has hiked fares every year since 1998, boosting inflation-adjusted fares 82 percent. The problem is that GGBHTD isn’t thinking like a business, where income is more than just a function of price, and it’s not thinking like a government agency, with broader societal concerns than mere income. The end result is a nonsensical and unjust policy of never-ending fare hikes far beyond inflation and ever-slower commutes. The core technical mission of GGBHTD should be to help prevent congestion in the areas most immediately effected by its policies, namely Central and Southern Marin, and work with the transit and congestion management agencies in San Francisco, Marin, and Sonoma to prevent or mitigate it in the rest of its commute shed. This would fit with the original founding purpose of Golden Gate Transit, which was to resolve congestion on the Golden Gate Bridge. To ensure its historic, technical mission is fulfilled, GGBHTD needs to rework its pricing scheme with congestion in mind. This will mean tolls will rise, but not necessarily too much. If fares stay flat or even decrease, that daily congestion toll may not need to rise nearly so much to ensure congestion is alleviated. Physical changes, such as creating carpool lanes on 101 as far as Lombard in San Francisco, will also help mitigate congestion and, therefore, that toll hike. The core social justice mission for GGBHTD should be to ensure transit is a tool of freedom for the poor and car-free, rather than make this one more way they can’t succeed. This would fit with the original purpose of having Greyhound take up the transit slack once our light rail system was put out of business by GGBHTD. Yet progress is made in this equally historic social justice mission simply when GGBHTD meets its technical mission, which by necessity will decrease the fare/toll gap. If the district invests the new toll revenue in more frequent bus service and better bus infrastructure, it will elevate raise the prestige and enjoyment of using the bus system. Finally, GGBHTD’s efforts will increase ridership (and therefore fares), to meet its new mission of keeping fare revenue in sync with operating costs. The ever-rising gap between fares and tolls is symptomatic of deep dysfunction in the heart of GGBHTD. An obsession with a single metric – revenue – has led to an incredibly inefficient transportation system and caused the district to fail in the missions it was founded to accomplish. Drivers, riders, the poor, the rich – all suffer under this scheme. *As Golden Gate Transit doesn’t keep historic bus and ferry fares available online, rather just fare increases, this is backwards-calculated from the average cost to travel from the North Bay to San Francisco on bus and ferry. GGT also doesn’t keep historic fare increases available from before 1993.